Wonderful painings and photos! Those dogs (and highland cattle too) are truly beautiful! Thanks for your kind words Lila, and thanks for visiting! 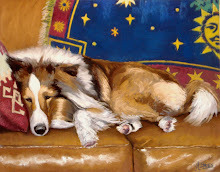 Hi Judith, Great Blog, great paintings. Can't wait to see the show! What a beautiful painting of Beauty and her baby! And I only wish that I could visit Sycamore Spring Farm! Sounds like such a wonderful place and the pups are adorable! Will be looking forward to the series. Hi, I had noticed earlier today that you had added yourself as a follower of my blog. 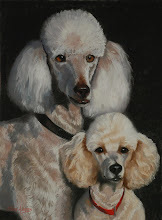 I came over and perused your blog and fell in love with your paintings. 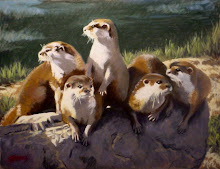 Those Highland cattle are wonderful, and I love, love, love your river otters. The otter is one of my totems. Some you choose - some choose you, and the otter is one I chose (both river and ocean). However, I was interrupted and logged out. When I came back to the computer this evening, I found an e-mail from my very good blogging friend Lila of Indigo Pears (she is at the top of this comment list - sister of Elaine Thaxton Reynolds) telling me about her connection with you. What a small world! I don't know how you found me but am wondering if it was the Scottish connection?? How I long to visit the home of my ancestors (and current relatives!) but I doubt I will ever get there. I am definitely adding you to my blog roll. Judith, thank you for the lovely comment on my faerietale of inspiration blog, so glad you like it. 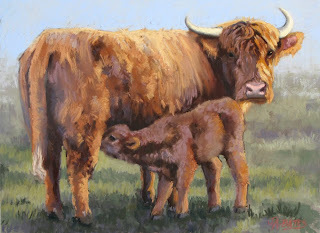 I love the painting of the highland cattle, we have a field full of these characters just around the corner, they are fascinating creatures. My daughter loves them for her hair is the same colour lol. Thanks Robert and Marguerite...I have about three more paintings to do in four weeks to be totally ready for my upcoming show. I guess you could say the crunch is on!